Secluded hideaway with views of the Sangre de Cristo mountain range, foothills and City lights of Santa Fe! 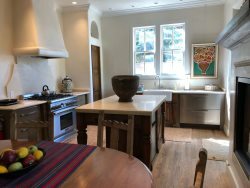 The home has tile floors, plaster walls and vigas to afford a contemporary Santa Fe flavor. The living room has a large entertainment center as well as a traditional kiva fireplace. Adjoining the living area is an open kitchen with breakfast room as well as a formal dining room with mountain views. This custom home comfortably sleeps six guests with three private bedroom suites. The master bedroom king suite is situated in a private corner of the home with a large bath with double sinks, shower and tub. The guest's bedrooms off the entry each offer a queen bed and ensuite full bath. There is also a powder room off the entry. For the working guest, there is a wonderful, quiet library office for your use - bring your lap top and you are set. Work and listen to the refreshing sound of the fountain in the entry. The views from the covered portals are stunning and relaxing. Outdoor dining and gas BBQ complete the setting. Hot tub is not operational. There is a three car garage with plenty of storage. This home is available for long term lease. Owners will consider pets. As always, our stay was wonderful, Thanks to Proctor P.M. we were without wants or needs. great job !!! It is always a pleasure working with Elaine.